Waukesha Civic Theatre is taking a “gender spin” in its revival of the Kaufman and Hart’s comedy You Can’t Take It With You. It’s still 1938 but the eccentric Sycamore clan will be headed by a matriarch called “Nana”. New Berlin-based veteran actress Antoinette Stikl will step into the shoes of the typically male role when the play opens on October 18. “This beloved, Pultizer-prize-winning comedy has been a revival favorite for theatres of all kinds since its premiere almost 77 years ago,” says first-time WCT director, John Kibler. In his research for the play, which premiered in December 1936, the idea of casting a woman in the patriach’s role took shape because all the historical information supported the idea so well. “Often during the Depression, women stepped into men’s traditional role of family breadwinner out of necessity,” says Kibler, “given that many men refused clerical and secretarial jobs that were typically identified with women.” The rapid growth of the New Deal in the early 1930’s lead to the first female cabinet secretary in American history (Frances Perkins, Secretary of Labor) and expanded working opportunities for all working women (not to mention the two million unemployed in 1933) dealing with the economic and social challenges of the Great Depression. “The affirmation of individuality that lies at the heart of this play,” says Kibler, “creates the perfect environment for Nana Vanderhoff to share the Sycamore family’s belief in charm, wisdom, eccentricity, innocence, selflessness and good will to a 21st century audience.” Eager to forget the bad news at home and the worse news abroad, people flocked to You Can’t Take It With You when it opened in 1936 for a much needed laugh. Nana Vanderhoff will provide that same experience for a 21st century audience eager for exactly the same thing. We are very proud of our current production, The Goodbye Girl. It is the second mainstage production in our 57th season and it is beginning its second weekend of performances on Friday at 8pm. If you are looking for an entertaining night with witty banter, excellent musical numbers, and snappy dance routines, then this is the show for you. Hurry and get your tickets today because there are only 10 performance left (5 this weekend and 5 next weekend) of this amazing show. There are many different way to purchase tickets to the show: by calling our box office at (262) 547-0708, on The Goodbye Girl page on our website, at our Facebook page, or by stopping in at the theatre. Still not sure? Check out these fantastic photos from the show. 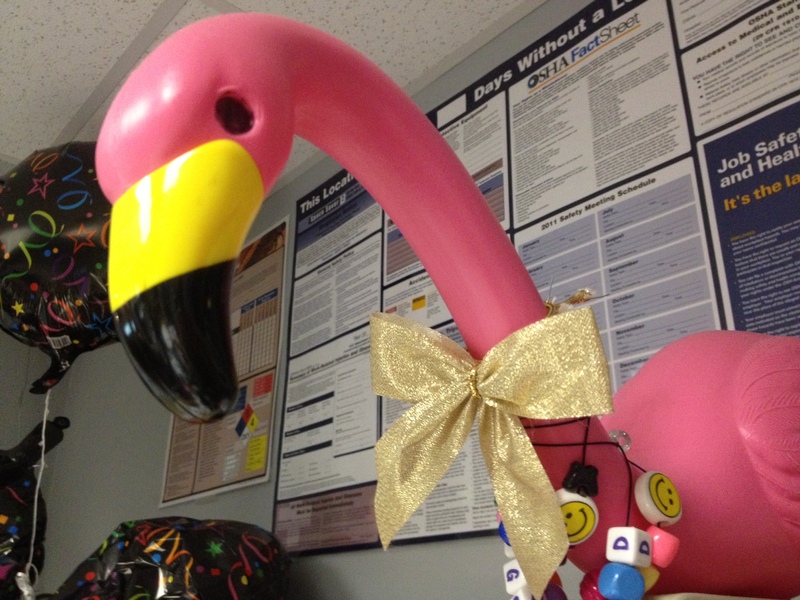 Floyd the Flamingo, local celebrity and COO (Chief Office Ornithologist) of WCT recently sat down with the new(ish) Office Manager Kelly Doherty. Floyd: I know the people here at Civic are just dying to know more about you. Are you originally from the Waukesha area? Kelly: In northern Minnesota I was born and raised. On the lake is where I spent most of my days. Swimming and kayaking, paddling the canoe, throwing some Bocce Ball (man, I was cool). To make a long story short, my family moved to Madison when I was in grade school when my dad got a new job. Floyd: Did you always want to work in theatre, or was this job a crazy random happenstance? Kelly: Theatre has been a very big part of my life ever since middle school when I got cast in my very first show. In high school, I wowed audiences in such critically acclaimed roles as Offstage Voice and Lady 1, just to name a few. Buoyed by the success of those roles, I decided theatre was my life and focused on it all through college. It is really great that I still work in theatre. I can’t say that about all of my classmates. Floyd: Do you ever bridge out into the performing aspect of theatre, or you a strictly behind the scenes kind of gal? Kelly: Since moving to Milwaukee six years ago, I’ve appeared onstage with a number of theatre companies including Optimist Theatre, Uprooted Theatre, and was a founding member of Kohl’s Wild Theatre. I’ve most recently appeared as Oddyseus in the The Penelopiad with Luminous Theatre, and as Sister Berthe in The Sound of Music with Skylight Music Theatre. You may have also seen me perform in WCT’s very own Comedy Tonight’s Love American Style this past February. I have recently added the title Playwright to my resume and have written a few shows for Kohl’s Wild Theatre. When I’m not acing, writing, or office managing, I also teach a number of our ACT classes. Floyd: What kind of things do you like to do in you free time? Kelly: When not doing theatre, you can usually find me knitting, sewing, or reading, usually with the assistance of my ever-helpful lap-cat Christine (yes, she is named after the ingénue from Phantom of the Opera). She is very good at holding things down so they do not float away. I also love thrifting. Macklemore got nothing on me. Floyd: If you could be any bird, what kind would you be and why? Kelly: I would like to be a little penguin because they are so flippin’ cute and everybody loves them. Also, sushi is my favorite food. Floyd: What is the one thing you would like everyone to know? Kelly: I am the funniest person my little sister knows. No joke. Comments Off on Meet The…Office Manager!